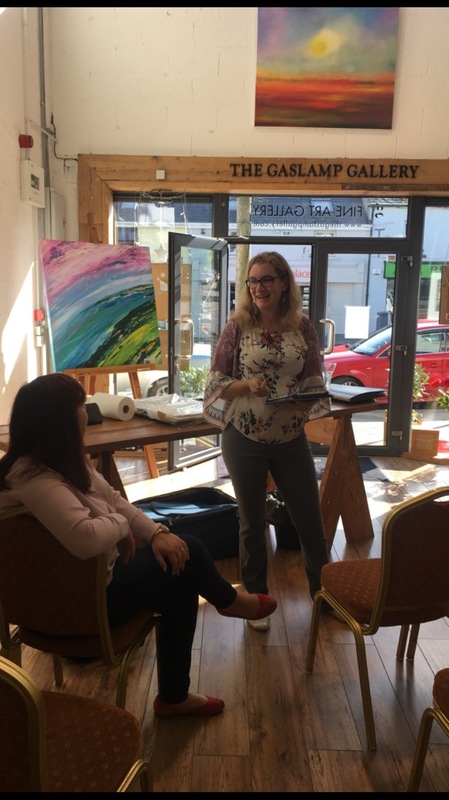 While in Ireland, I had the privilege of teaching at the Gaslamp Gallery in Gorey, Co. Wexford. Gallery owner Claire, and student Ethy helped me organize and plan, and served as hosts for this evening event. Demonstrations like this have a different vibe than a teaching workshop. I find that when I don't have students to supervise, I can share more from the heart and express not just thoughts on painting, but on my love for watercolour, and the journey that has brought me to this place where I get to be my own favourite artist. I heard a speech from an acclaimed artist where she denigrated the word "journey" in the context of art as being too cliché, but I disagree. There's no better way that I have found to describe the process of becoming an artist and mastering your chosen medium. There's a choice to begin; stages of growth, each with their own unique challenges; there are side roads and detours and a destination always just out of reach. When I started painting, I initially thought that I would probably become a botanical artist. My first paintings were THAT controlled! I spent years moving in a direction that emphasized accuracy and detail in my painting, objectives that are secondary to my process now. I don't view those years to be wasted, rather, they were essential to my development as an artist. Without the hundreds of hours spent building technique, I wouldn't be able to paint with confidence. I also know that I can paint realistically; I just choose not to, and that helps me teach more confidently. You have permission to enjoy the journey. Likewise, your artistic journey is going to take you places you never planned to go. It might take longer than you anticipated. The destination doesn't matter; it's the journey that counts, so make your goal to enjoy the view. You're in the driver's seat, but the road might twist and turn in a few directions you didn't foresee, so you don't have complete control; you have to relinquish a little so that you aren't bumping along in the ditch! You had what you needed all along! In his 'Creative Pep Talk' podcast (episode 199), Andy J. Pizza talks about the journey as a Wizard of Oz metaphor. The ruby slippers are on your feet right now; you just have to learn how to use them. The best artists are creative problem solvers, learning to use the tools we have, within our limitations, to express our ideas. Choice is never infinite; we are always reaching for just a little more (skill, ability, time), but what we need is found within. Learning to trust that this is true is our Dorothy's revelation "You had what you needed all along!" Let me be your Glinda. I guess that makes me a Glinda, the Good Witch, doesn't it? She always had a bit of a duster role in the Wizard of Oz; she'd show up and give advice and insight, but if Dorothy was hoping for someone to take over and fix everything, she was sadly disappointed. My role is very similar; as a watercolour instructor, once you have the basic techniques, my role is much more about guidance and insight; the journey is yours. Unlike Glinda, I'm happy to walk along with you on your journey. From October 1-15th, we'll be painting through the lessons in Lovely Loose Florals in watercolour. You can join us and paint along! Watercolor Mastery starts October 16th, with free "am I ready for this" pre-lessons. Sign up here to be notified when the series begins. Three Watercolour Mentors who have helped me grow as an artist.